The first patch will roll out on December 4, with a second patch coming December 11. Fallout 76 players wondering when the next round of patches will release will be delighted to hear that the game is getting two patches over the next two weeks. The first patch will launch on December 4 and includes a variety of fixes and improvements. As expected, the patch will be spearheaded by stability improvements to the game client and servers. After that, an AFK feature will be implemented. If a player is inactive after 10 minutes, they’ll be disconnected from the server. Of course, a warning will be sent to the player one minute prior to the disconnect letting them know they’ve been marked as inactive. Stash size is getting a buff, with max Stash at 600 rather than 400. Another boost is being given to automatic weapon damage, which will increase by 20 percent. To remedy bugged drops, boss enemies are now guaranteed to drop two to four items relative to their difficulty level. Other bug fixes include a fix to enemy health bar glitches and C.A.M.P. items not showing. 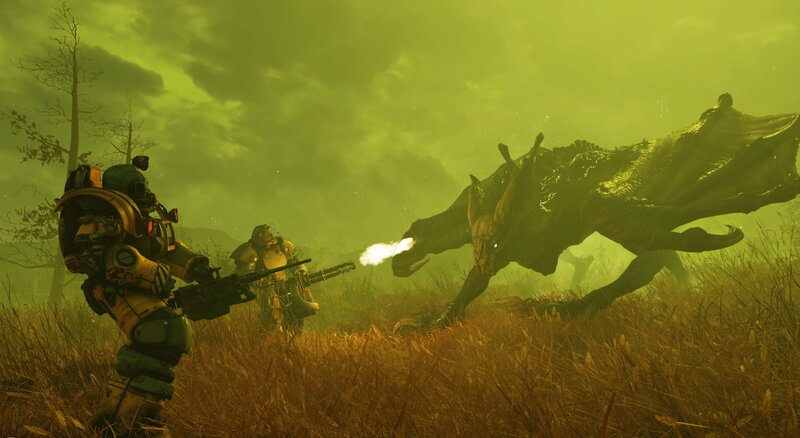 Boss enemies will have guaranteed drops of two to four items in Fallout 76. Overencumbered players will now respawn at the nearest discovered location after death, rather than being sent all the way back to Vault 76. This happened to us, and we have to say, it was exceedingly frustrating so it’s nice to hear a fix is being added in the next Fallout 76 patch. As stated above, the first patch will drop on December 4 for Xbox One, PlayStation 4, and PC. This patch will be followed a week later by a second patch on December 11 which includes even more improvements and bug fixes. For example, added C.A.M.P. improvements and (to the delight of many) respec option for SPECIALs once players reach Level 50 and above. Are you looking forward to the two upcoming patches for Fallout 76? If so, what feature or improvement excites you the most? Let us know down in the comments below! For more on Fallout 76, be sure to check out some of our previous features including the backlash over the bag delivered with the Power Armor edition of Fallout 76, how Bethesda is facing a possible lawsuit over their Fallout 76 refund policy, and the controversy over how physical PC copies of Fallout 76 included a cardboard disc.